1 Waiting, I waited for Jehovah, And He bent to me and heard my [loud] cry. 3 And put in my mouth a new song, Praise unto our God. Many shall see and fear, And trust in Jehovah. 4 Blessed is the man who has made Jehovah his trust, And has not turned [away] to the proud and deserters to a lie. 5 In multitudes hast Thou wrought, Jehovah, my God; Thy wonders and Thy purposes towards us-- There is none to be set beside Thee-- Should I declare them and speak them, They surpass numbering. 6 Sacrifice and meal-offering Thou didst not delight in-- Ears hast Thou pierced for me-- Burnt-offering and sin-offering Thou didst not demand. 8 To do Thy pleasure, my God, I delight, And Thy law is within my inmost parts. 9 I proclaimed glad tidings of Thy righteousness in the great congregation; Behold, my lips I did not restrain, Jehovah, Thou knowest. 10 Thy righteousness did I not hide within my heart; Thy faithfulness and Thy salvation did I speak; I concealed not Thy loving-kindness and Thy truth from the great congregation. 11 Thou, Jehovah, wilt not restrain Thy compassions from me; Thy loving-kindness and Thy troth will continually preserve me. 12 For evils beyond numbering have compassed me; My iniquities have overtaken me, and I am not able to see: They surpass the hairs of my head, And my heart has forsaken me. 13 Be pleased, Jehovah, to deliver me; Jehovah, hasten to my help. 14 Shamed and put to the blush together be the seekers after my soul to carry it away! Turned back and dishonoured be they who delight in my calamity! 15 Paralysed by reason of their shame Be they who say to me, Oho! Oho! 16 Joyful and glad in Thee be all who seek Thee! Jehovah be magnified, may they ever say who love Thy salvation! 17 But as for me, I am afflicted and needy; The Lord purposes [good] for me: My Help and my Deliverer art Thou; My God, delay not. The closing verses of this psalm reappear with slight changes as an independent whole in Psalm lxx. The question arises whether that is a fragment or this a conglomerate. Modern opinion inclines to the latter alternative, and points in support to the obvious change of tone in the second part. But that change does not coincide with the supposed line of junction, since Psalm lxx. begins with our ver. 13, and the change begins with ver. 12. Cheyne and others are therefore obliged to suppose that ver. 12 is the work of a third poet or compiler, who effected a junction thereby. The cumbrousness of the hypothesis of fusion is plain, and its necessity is not apparent, for it is resorted to in order to explain how a psalm which keeps so lofty a level of confidence at first should drop to such keen consciousness of innumerable evils and such faint-heartedness. But surely such resurrection of apparently dead fears is not uncommon in devout, sensitive souls. They live beneath April skies, not unbroken blue. However many the wonderful works which God has done and however full of thankfulness the singer's heart, his deliverance is not complete. The contrast in the two parts of the psalm is true to facts and to the varying aspects of feeling and of faith. Though the latter half gives greater prominence to encompassing evils, they appear but for a moment; and the prayer for deliverance which they force from the psalmist is as triumphant in faith as were the thanksgivings of the former part. In both the ground tone is that of victorious grasp of God's help, which in the one is regarded in its mighty past acts, and in the other is implored and trusted in for present and future needs. The change of tone is not such as to demand the hypothesis of fusion. The unity is further supported by verbal links between the parts: e.g. , the innumerable evils of ver. 12 pathetically correspond to the innumerable mercies of ver. 5, and the same word for "surpass" occurs in both verses; "be pleased" in ver. 13 echoes "Thy pleasure" (will, A.V.) in ver. 8; "cares" or thinks (A.V.) in ver. 17 is the verb from which the noun rendered purposes (thoughts, A.V.) in ver. 5 is derived. The attribution of the psalm to David rests solely on the superscription. The contents have no discernible points of connection with known circumstances in his or any other life. Jeremiah has been thought of as the author, on the strength of giving a prosaic literal meaning to the obviously poetical phrase "the pit of destruction" (ver. 2). If it is to be taken literally, what is to be made of the "rock" in the next clause? Baethgen and others see the return from Babylon in the glowing metaphors of ver. 2, and, in accordance with their conceptions of the evolution of spiritual religion, take the subordination of sacrifice to obedience as a clear token of late date. We may, however, recall 1 Sam. xv. 22, and venture to doubt whether the alleged process of spiritualising has been so clearly established, and its stages dated, as to afford a criterion of the age of a psalm. In the first part, the current of thought starts from thankfulness for individual deliverances (vv. 1-3); widens into contemplation of the blessedness of trust and the riches of Divine mercies (vv. 4, 5); moved by these and taught what is acceptable to God, it rises to self-consecration as a living sacrifice (vv. 6-8); and, finally, pleads for experience of God's grace in all its forms on the ground of past faithful stewardship in celebrating these (vv. 9-11). The second part is one long-drawn cry for help, which admits of no such analysis, though its notes are various. The first outpouring of the song is one long sentence, of which the clauses follow one another like sunlit ripples, and tell the whole process of the psalmist's deliverance. It began with patient waiting; it ended with a new song. The voice first raised in a cry, shrill and yet submissive enough to be heard above, is at last tuned into new forms of uttering the old praise. The two clauses of ver. 1 ("I" and "He") set over against each other, as separated by the distance between heaven and earth, the psalmist and his God. He does not begin with his troubles, but with his faith. "Waiting, he waited" for Jehovah; and wherever there is that attitude of tense and continuous but submissive expectance, God's attitude will be that of bending to meet it. The meek, upturned eye has power to draw His towards itself. That is an axiom of the devout life confirmed by all experience, even if the tokens of deliverance delay their coming. Such expectance, however patient, is not inconsistent with loud crying, but rather finds voice in it. Silent patience and impatient prayer, in too great a hurry to let God take His own time, are equally imperfect. But the cry, "Haste to my help" (ver. 13), and the final petition, "My God, delay not," are consistent with true waiting. The suppliant and God have come closer together in ver. 2, which should not be regarded as beginning a new sentence. As in Psalm xviii., prayer brings God down to help. His hand reaches to the man prisoned in a pit or struggling in a swamp; he is dragged out, set on a rock, and feels firm ground beneath his feet. Obviously the whole representation is purely figurative, and it is hopelessly flat and prosaic to refer it to Jeremiah's experience. The "many waters" of Psalm xviii. are a parallel metaphor. The dangers that threatened the psalmist are described as "a pit of destruction," as if they were a dungeon into which whosoever was thrown would come out no more, or in which, like a wild beast, he has been trapped. They are also likened to a bog or quagmire, in which struggles only sink a man deeper. But the edge of the bog touches rock, and there is firm footing and unhindered walking there, if only some great lifting power can drag the sinking man out. God's hand can, and does, because the lips, almost choked with mire, could yet cry. The psalmist's extremity of danger was probably much more desperate than is usual in such conditions as ours, so that his cries seem too piercing for us to make our own; but the terrors and conflicts of humanity are nearly constant quantities, though the occasions calling them forth are widely different. If we look deeper into life than its surface, we shall learn that it is not violent "spiritualising" to make these utterances the expression of redeeming grace, since in truth there is but one or other of these two possibilities open for us. Either we flounder in a bottomless bog, or we have our feet on the Rock. God's deliverance gives occasion for fresh praise. 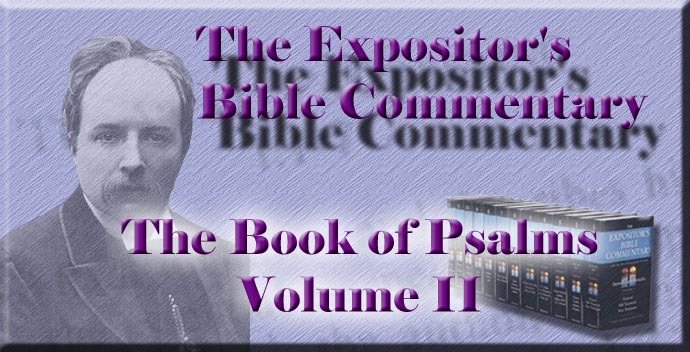 The psalmist has to add his voice to the great chorus, and this sense of being but one of a multitude, who have been blessed alike and therefore should bless alike, occasions the significant interchange in ver. 3 of "my" and "our," which needs no theory of the speaker being the nation to explain it. It is ever a joy to the heart swelling with the sense of God's mercies to be aware of the many who share the mercies and gratitude. The cry for deliverance is a solo; the song of praise is choral. The psalmist did not need to be bidden to praise; a new song welled from his lips as by inspiration. Silence was more impossible to his glad heart than even to his sorrow. To shriek for help from the bottom of the pit and to be dumb when lifted to the surface is a churl's part. Though the song was new in this singer's mouth, as befitted a recipient of deliverances fresh from heaven, the theme was old; but each new voice individualises the commonplaces of religious experience, and repeats them as fresh. And the result of one man's convinced and jubilant voice, giving novelty to old truths because he has verified them in new experiences, will be that "many shall see," as though they behold the deliverance of which they hear, "and shall fear" Jehovah and trust themselves to Him. It was not the psalmist's deliverance, but his song, that was to be the agent in this extension of the fear of Jehovah. All great poets have felt that their words would win audience and live. Thus, even apart from consciousness of inspiration, this lofty anticipation of the effect of his words is intelligible, without supposing that their meaning is that the signal deliverance of the nation from captivity would spread among heathens and draw them to Israel's faith. The transition from purely personal experience to more general thoughts is completed in vv. 4, 5. Just as the psalmist began with telling of his own patient expectance and thence passed on to speak of God's help, so in these two verses he sets forth the same sequence in terms studiously cast into the most comprehensive form. Happy indeed are they who can translate their own experience into these two truths for all men: that trust is blessedness and that God's mercies are one long sequence, made up of numberless constituent parts. To have these for one's inmost convictions and to ring them out so clearly and melodiously that many shall be drawn to listen, and then to verify them by their own "seeing," is one reward of patient waiting for Jehovah. That trust must be maintained by resolute resistance to temptations to its opposite. Hence the negative aspect of trust is made prominent in ver. 4 b, in which the verb should be rendered "turns not" instead of "respecteth not," as in the A.V. and R.V. The same motion, looked at from opposite sides, may be described in turning to and turning from. Forsaking other confidences is part of the process of making God one's trust. But it is significant that the antithesis is not completely carried out, for those to whom the trustful heart does not turn are not here, as might have been expected, rival objects of trust, but those who put their own trust in false refuges. "The proud" are the class of arrogantly self-reliant people who feel no need of anything but their own strength to lean on. "Deserters to a lie" are those who fall away from Jehovah to put their trust in any creature, since all refuges but Himself will fail. Idols may be included in this thought of a lie, but it is unduly limited if confined to them. Much rather it takes in all false grounds of security. The antithesis fails in accuracy, for the sake of putting emphasis on the prevalence of such mistaken trust, which makes it so much the harder to keep aloof from the multitudes and stand alone in reliance on Jehovah. Ver. 5 corresponds with ver. 4, in that it sets forth in similar generality the great deeds with which God is wont to answer man's trust. But the personality of the poet breaks very beautifully through the impersonal utterances at two points: once when he names Jehovah as "my God," thus claiming his separate share in the general mercies and his special bond of connection with the Lover of all; and once when he speaks of his own praises, thus recognising the obligation of individual gratitude for general blessings. Each particle of finely comminuted moisture in the rainbow has to flash back the broad sunbeam at its own angle. God's "wonders and designs" are "realised Divine thoughts and Divine thoughts which are gradually being realised" (Delitzsch). These are wrought and being wrought in multitudes innumerable; and, as the psalmist sees the bright, unbroken beams pouring forth from their inexhaustible source, he breaks into an exclamation of adoring wonder at the incomparable greatness of the ever-giving God. "There is none to set beside Thee" is far loftier and more accordant with the tone of the verse than the comparatively flat and incongruous remark that God's mercies cannot be told to Him (A.V. and R.V.). A precisely similar exclamation occurs in Psalm lxxi. 19, in which God's incomparable greatness is deduced from the great things which He has done. Happy the singer who has an inexhaustible theme! He is not silenced by the consciousness of the inadequacy of his songs, but rather inspired to the never-ending, ever-beginning, joyful task of uttering some new fragment of that transcendent perfection. Innumerable wonders wrought should be met by ever-new songs. If they cannot be counted, the more reason for open-eyed observance of them as they come, and for a stream of praise as unbroken as is their bright continuance. If God's mercies thus baffle enumeration and beggar praise, the question naturally rises, "What shall I render to the Lord for all His benefits?" Therefore the next turn of thought shows the psalmist as reaching the lofty spiritual conception that heartfelt delight in God's will is the true response to God's wonders of love. He soars far above external rites as well as servile obedience to unloved authority, and proclaims the eternal and ultimate truth that what God delights in is man's delight in His will. The great words which rang the knell of Saul's kingship may well have sounded in his successor's spirit. Whether they are the source of the language of our psalm or not, they are remarkably similar. "To obey is better than sacrifice, and to hearken than the fat of rams" (1 Sam. xv. 23), teaches precisely the same lesson as vv. 6-8 of this psalm. The strong negation in ver. 6 does not deny the Divine institution of the sacrificial law, but affirms that something much deeper than external sacrifices is the real object of God's desire. The negation is made emphatic by enumerating the chief kinds of sacrifice. Whether they are bloody or bloodless, whether meant to express consecration or to effect reconciliation, they are none of them the true sacrifices of God. In ver. 6 the psalmist is entirely occupied with God's declarations of His requirements; and he presents these in a remarkable fashion, intercalating the clause, "Ears hast Thou pierced for me," between the two parallel clauses in regard to sacrifice. Why should the connection be thus broken? The fact that God has endowed the psalmist with capacity to apprehend the Divine speech reveals God's desire concerning him. Just because he has ears to hear, it is clear that God wishes him to hear, and therefore that outward acts of worship cannot be the acknowledgment of mercies in which God delights. The central clause of the verse is embedded in the others, because it deals with a Divine act which, pondered, will be seen to establish their teaching. The whole puts in simple, concrete form a wide principle, namely, that the possession of capacity for receiving communications of God's will imposes the duty of loving reception and obedience, and points to inward joyful acceptance of that will as the purest kind of worship. Vv. 7 and 8 are occupied with the response to God's requirements thus manifested by His gift of capacity to hear His voice. "Then said I." As soon as he had learned the meaning of his ears he found the right use of his tongue. The thankful heart was moved to swift acceptance of the known will of God. The clearest recognition of His requirements may coexist with resistance to them, and needs the impulse of loving contemplation of God's unnumbered wonders to vivify it into glad service. "Behold, I am come," is the language of a servant entering his master's presence in obedience to his call. In ver. 7 the second clause interrupts just as in ver. 6. There the interruption spoke of the organ of receiving Divine messages as to duty; here it speaks of the messages themselves: "In the roll of the book is my duty prescribed for me." The promise implied in giving ears is fulfilled by giving a permanent written law. This man, having ears to hear, has heard, and has not only heard, but welcomed into the inmost recesses of his heart and will, the declared will of God. The word rendered "delight" in ver. 8 is the same as is rendered "desire" in ver. 6 (A.V. ); and that rendered by the A.V. and R.V. in ver. 8 "will" is properly "good pleasure." Thus God's delight and man's coincide. Thankful love assimilates the creature's will with the Divine, and so changes tastes and impulses that desire and duty are fused into one. The prescriptions of the book become the delight of the heart. An inward voice directs. "Love, and do what Thou wilt"; for a will determined by love cannot but choose to please its Beloved. Liberty consists in freely willing and victoriously doing what we ought, and such liberty belongs to hearts whose supreme delight is to please the God whose numberless wonders have won their love and made their thanksgivings poor. The law written in the heart was the ideal even when a law was written on tables of stone. It was the prophetic promise for the Messianic age. It is fulfilled in the Christian life in the measure of its genuineness. Unless the heart delights in the law, acts of obedience count for very little. The quotation of vv. 7, 8, in Heb. x. 5-7, is mainly from the LXX., which has the remarkable rendering of ver. 6 b, "A body hast Thou prepared for me." Probably this is meant as paraphrase rather than as translation; and it does represent substantially the idea of the original, since the body is the instrument for fulfilling, just as the ear is the organ for apprehending, the uttered will of God. The value of the psalm for the writer of Hebrews does not depend on that clause, but on the whole representation which it gives of the ideal of the perfectly righteous servant's true worship, as involving the setting aside of sacrifice and the decisive pre-eminence of willing obedience. That ideal is fulfilled in Jesus, and really pointed onwards to Him. This use of the quotation does not imply the directly Messianic character of the psalm. "Out of the abundance of the heart the mouth speaketh," and thus the passage is easy from inward delight in God's will to public declaration of His character. Every true lover of God is a witness of His sweetness to the world. Since the psalmist had His law hidden in the depths of his being, he could not "hide" His righteousness within his heart, but must magnify it with his tongue. That is a feeble and doubtful love which knows no necessity of utterance. To "love and be silent" is sometimes imperative, but always burdensome; and a heart happy in its love cannot choose but ripple out in music of speech. The psalmist describes himself as a messenger of glad tidings, a true evangelist. The multiplicity of names for the various aspects of God's character and acts which he heaps together in these verses serves to indicate their manifoldness, which he delighted to contemplate, and his long, loving familiarity with them. He sets his treasure in all lights, and views it from all points, as a man will turn a jewel in his hand and get a fresh flash from every facet. "Righteousness," the good news that the Ruler of all is inflexibly just, with a justice which scrupulously meets all creatures' needs and becomes penal and awful only to the rejecters of its tender aspect; "faithfulness," the inviolable adherence to every promise; "salvation," the actual fulness of deliverance and well-being flowing from these attributes; "loving-kindness" and "troth," often linked together as expressing at once the warmth and the unchangeableness of the Divine heart--these have been the psalmist's themes. Therefore they are his hope; and he is sure that, as he has been their singer, they will be his preservers. Ver. 11 is not prayer, but bold confidence. It echoes the preceding verse, since "I did not restrain" (ver. 9) corresponds with "Thou wilt not restrain," and "Thy loving-kindness and Thy troth" with the mention of the same attributes in ver. 10. The psalmist is not so much asserting his claims as giving voice to his faith. He does not so much think that his utterance is deserving of remuneration as that God's character makes impossible the supposition that he, who had so loved and sung His great name in its manifold glories, should find that name unavailing in his hour of need. There is an undertone of such felt need even in the confidence of ver. 11; and it becomes dominant from ver. 12 to the end, but not so as to overpower the clear note of trust. The difference between the two parts of the psalm is great, but is not to be exaggerated as if it were contrariety. In the former part thanksgiving for deliverance from dangers recently past predominates; in the latter, petition for deliverance from dangers still threatening: but in both the psalmist is exercising the same confidence; and if in the beginning he hymns the praises of God who brought him out of the pit of destruction, in the end he keeps firm hold of Him as His "Help and Deliverer." Similarly, while in the first portion he celebrates the "purposes which are to usward," in the latter he is certain that, needy as he is, Jehovah has "purposes" of kindness to him. The change of tone is not so complete as to negative the original unity, and surely it is not difficult to imagine a situation in which both halves of the psalm should be appropriate. Are there any deliverances in this perilous and incomplete life so entire and permanent that they leave no room for future perils? Must not prevision of coming dangers accompany thankfulness for past escapes? Our Pharaohs are seldom drowned in the Red Sea, and we do not often see their corpses stretched on the sand. The change of tone, of which so much use is made as against the original unity of the psalm, begins with ver. 12; but that verse has a very strong and beautiful link of connection with the previous part, in the description of besetting evils as innumerable. Both words of ver. 5 are repeated, that for "surpass" or "are more than" in ver. 12 c, that for "number" in a. The heart that has felt how innumerable are God's thoughts and deeds of love is not utterly reduced to despair, even while it beholds a sea of troubles rolling its white-crested billows shoreward as far as the horizon. The sky stretches beyond them, and the true numberlessness of God's mercies outdoes the great yet really limited range of apparently numberless sins or sorrows, the consequences of sin. "Mine iniquities have overtaken me" like pursuing foes, and every calamity that held him in its grip was a child of a sin of his. Such consciousness of transgression is not inconsistent with "delight in the law of God after the inward man," as Paul found out (Rom. vii. 22, 23), but it sets aside the attempt to make this a directly Messianic psalm. "I am not able to see." Such is the only possible rendering, for there is no justification for translating the simple word by "look up." Either the crowd of surrounding calamities prevent the psalmist from seeing anything but themselves, or, more probably, the failure of vital power accompanying his sorrow dims his vision (Psalm xxxviii. 10). From ver. 13 onwards Psalm lxx. repeats this psalm, with unimportant verbal differences. The first of these is the omission of "Be pleased" in ver. 13, which binds this second part to the first, and points back to "Thy pleasure" (ver. 8). The prayer for the confusion of enemies closely resembles that in Psalm xxxv., ver. 14 being almost identical with vv. 4 and 26 there, and ver. 15 recalling ver. 21 of that psalm. The prayer that enemies may fail in their designs is consistent with the most Christlike spirit, and nothing more is asked by the psalmist, but the tinge of satisfaction with which he dwells on their discomfiture, however natural, belongs to the less lofty moral standard of his stage of revelation. He uses extraordinarily forcible words to paint their bewilderment and mortification--may they blush, turn pale, be driven back, be as if paralysed with shame at their baffled malice! The prayer for the gladness of God's servants and seekers is like Psalm xxxv. 27. It asks that fruition as complete as the disappointment of the foes may be the lot of those whose desires set towards God, and it is prophecy as well as prayer. Seekers after God ever find Him, and are more joyful in possession than they hoped to be while seeking. He alone never eludes search, nor ever disappoints attainment. They who long for His salvation will receive it; and their reception will fill their hearts so full of blessedness that their lips will not be able to refrain from ever-new outbursts of the old praise, "The Lord be magnified." Very plaintively and touchingly does the low sigh of personal need follow this triumphant intercession for the company of the saints. Its triple elements blend in one believing aspiration, which is not impatience, though it pleads for swift help. "I am afflicted and needy"; there the psalmist turns his eye on his own sore necessity. "Jehovah has purposes for me"; there he turns to God, and links his final petitions with his earlier trust by the repetition of the word by which he described (ver. 5) the many gracious designs of God. "My God, delay not"; there he embraces both in one act of faithful longing. His need calls for, and God's loving counsels ensure, swift response. He who delights when an afflicted and poor man calls Him "my God" will not be slack to vindicate His servant's confidence, and magnify His own name. That appeal goes straight to the heart of God.